- 52 beginning and intermediate postures from the Ghosh Yoga Lineage. - Detailed instructions and step-by-step photos for the setup and execution of each posture. - Explanations of the purpose, intention and benefits of each posture. - Modifications and building blocks for the more difficult postures. - Male and female bodies in each posture. - Complete and short-form posture series for your practice. Ghosh Yoga was founded in Calcutta, India by Bishnu Charan Ghosh, a bodybuilder and "physical culturist" who was a master of the human body and mind. The yoga is designed to stretch and strengthen all the muscles of the body as well as massage internal organs and glands, improving circulation and respiration and creating overall health in the body. 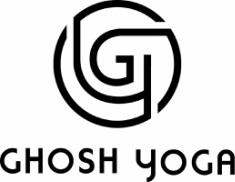 Ghosh Yoga's most accomplished teachers include Buddha Bose, Bikram Choudhury and Tony Sanchez. Ida Jo and Scott Lamps are musicians, yogis and yoga teachers. For years they dedicated themselves to the practice of Bikram's Beginning Class. They traveled to Los Cabos, Mexico to study intermediate and advanced yoga in the Ghosh Lineage with Tony Sanchez. They edited and published Buddha Bose's lost manuscript 84 Yoga Asanas. They each won 1st place in Wisconsin in USA Yoga's 2015 Regional Asana Championship. They travel nationally and internationally to teach yoga.